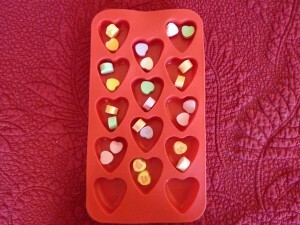 Candy hearts are another way to sneak in some math while using something that is really easy to find this time of year. This activity helps to build one to one correspondence, which involves being able to match an object or group of objects with the number that represents it. 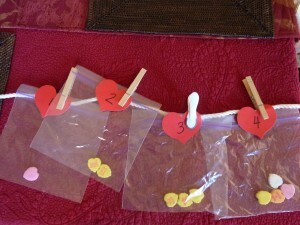 I placed a certain number of candy hearts inside of a small plastic bag. (In this case, I used #1-5, but you could do whatever numbers your child is ready for, and they don’t have to be in order especially if you are working on larger numbers.) You could also place them in containers, muffin papers/tins or paper/plastic cups. I printed the numbers that went with the bags on a calendar cutout. I attached the bags to my clothesline (to sneak in some fine motor skill building 🙂 ) and set out the numbers. Find the bag that has the same number of candy hearts inside. Clip the number with the bag. Click here for a previous post on using math organizers and dice to practice math facts. 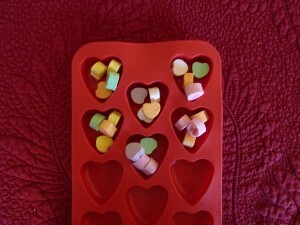 The materials shown went with a December theme but can be switched out for candy hearts to go with a February theme. See how easy it is to use basic materials to build math skills while keeping it fun and thematic!! This is an activity inspired by my years teaching 3rd grade. When working on multiplication concepts with my students, it was really important to make sure that they understood that multiplication actually stands for “equal groups of.” Example: 4×3 actually means 4 groups of 3. This also works for division – starting with this number, when divided into groups of ___, we have ___ sets. Example: If we started with 12 hearts and divided them into groups of 3, we would have 4 equal groups so 12 / 3=4. 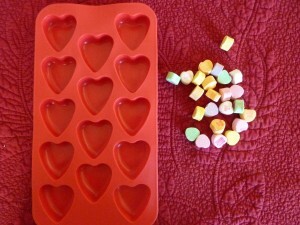 For this activity, I chose a certain number of candy hearts and used a cute ice-cube tray as a counting tray. 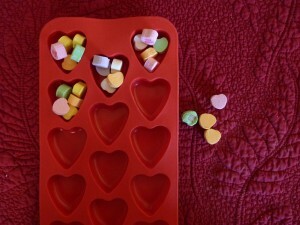 Once at the station, we would first count and see how many hearts we had. Next, we would see if we could make equal groups of 2. If so, we knew it was an even number and if not it was odd. If it was even, than we counted how many equal groups we had in order to make our equation: ___ groups of 2= ___. 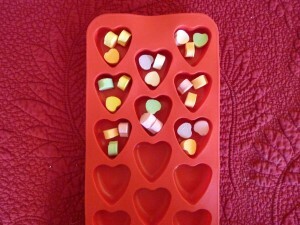 Depending on the number of hearts I had provided, we would usually go up to about 5 so we could count by fives. Equal groups of 4 works as well! Building math concepts and skills can be fun and doesn’t always have to involve paper/pencil activities or flash cards. If your child struggles with numbers or math facts, I encourage you to look no further than your pantry to find “manipulatives” (candy, Cheerios, goldfish crackers, dried beans, etc.). It is so important for them to get a good understanding of what the numbers and symbols represent and what they are really doing before being expected to do it all in their head or on paper.